Beacon Support offers care and support services for assisted holidays so you and your family can travel with ease. We are highly experienced in supporting travel for people with disabilities with a wide range of assistance made available to you. All successful holidays require careful planning to ensure your holiday is carefree and enjoyable. The staff at Beacon Support have been caring for people with disabilities for more than 17 years, and we can bring a wealth of experience to your holiday planning. We can help you with your assisted holiday in terms of destination and accommodation choices as well as logistical considerations. 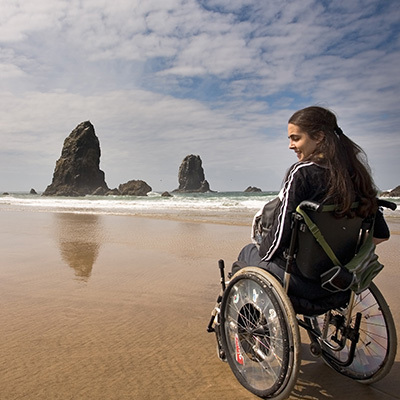 We can help on the trip itself with providing mobility support and personal care assistance. Our carers are trained and compassionate and we will carefully match them with your personality and values. Our assisted holiday care, will leave you free to enjoy your holiday with little stress and anxiety. We can help you with a customised support package for your holiday allowing you to experience a memorable and unique holiday of your choosing. Beacon Support is a National Disability Insurance Scheme (NDIS) service provider, so we can help eligible people to access funding for assisted holidays. Based on your level of independence, our supported holiday travel services will cover the right option for you. To make it easier to determine which holiday suits you the best, we have broken them into four categories. Just let us know what holiday you are looking for when speaking to our professionals at Beacon Support. Independent. You do not require personal care or assistance on a regular basis. You have strong communication and social skills and live an active lifestyle. You want to meet new people on this holiday and do not require a personal support assistant. Mobility Assistance. You can manage a few stairs at a time, but need extra assistance from a device such as a walker or wheelchair. Personal Care Assistance. You require assistance with your own personal care such as bathing, toileting, eating, etc. Physical Disability. You required a mobility device for all physical movement. Whether you’re planning a family holiday, an overseas adventure or just a weekend away, we can help. Contact Beacon Support today to find out how we can help with assisted holidays and travel for people with disabilities.